Hide deals from seller "C & D Auto Body Repair Inc."
Hide deals from category "Body Shops & Painting"
C & D Auto Body Repair Inc.
Limit 1 per person; may purchase 1 additional as gift. Limit 1 per transaction. Valid on 3 hours of repair labor. Parts not included. By appointment only; must mention voucher when scheduling. Promotional value expires 60 days after purchase. Restore your ride to its former glory with this deal for 50% off auto body repairs at C & D Auto Body Repair Inc., in Elburn ($144 value). This deal includes three hours of labor on your car, SUV or truck. In business for more than 25 years, this full-service repair shop has a reputation for excellent repairs and friendly service. Owners Randy and Kevin take pride in the high-quality work done at C & D Auto Body Repair. They offer a variety of services, including dent repair, glass repair and painting, which will help your vehicle look brand new. Since transportation can be an issue when your car is in the shop, C & D also offers car rental through Enterprise and Hertz. Hop on this deal for a smoother ride. 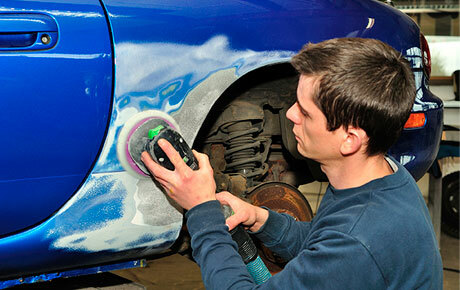 Auto repair shop in Elburn offering high-quality collision repairs.